Cold-blooded murder heats up Agatha's summer holiday! 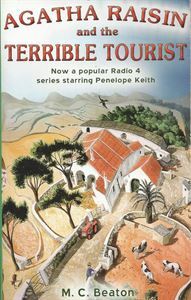 Agatha travels to Cyprus, only to contend with her estranged fiance, an egregious group of truly terrible tourists, and a string of murders. . . In this sixth entertaining outing Agatha leaves the sleepy Cotswold village of Carsely to pursue love - and finds a murderer. Spurned at the altar, she follows her fleeing fiancé James Lacey to Cyprus, where, instead of enjoying the honeymoon they'd planned, they witness the killing of an obnoxious tourist in a disco. Intrigue and a string of murders surround the unlikely couple, in a plot as scorching as the Cypriot sun!